PROPERTY investment is definitely not a short term play. The majority of us do understand this basic rule of the game, but how long do we need to wait before the harvest? The experts reckon that it will take at least five years to enjoy a significant capital gain from property investment, depending on location. For established areas, it may take a shorter time. To better explain how property investment can help you accumulate wealth, let’s check out the growth of average house prices in selected areas in the Klang Valley over the past 17 years based on Savills (Malaysia) Sdn Bhd’s (Savills Malaysia) collection of transaction data from 2001 to 2017. To put things in perspective, if you had purchased a single-storey terraced house for RM150,000 in Puchong, Selangor in 2001, after 10 or 15 years, how big would be the capital gains? According to the data, if the house was sold in 2010, it would probably receive an average price of RM237,500, which means that the capital appreciation was close to 40%. By 2017, the average selling price had surged to RM512,500, so if the same house was sold last year (2017), you would enjoy a capital growth of around 241%! Another example are double-storey terraced houses in Segambut, Kuala Lumpur. According to Savills’ data — this house type in Taman Sri Sinar and Taman Segambut Indah had recorded an average transaction price of RM178,500 in 2001, but the average price climbed to RM571,500 in 2017, a capital appreciation of 220%. Condominiums in Bangsar, KL have appreciated by around 94% to 167% over the past 17 years. For instance, condominiums in Bangsar (Sri Penaga, Cascadium and Tivoli Villa) had been transacted at an average RM366,333 in 2001 before rising by about 167% to almost RM980,000 in 2017. Savills Malaysia managing director Datuk Paul Khong says housing prices will continue to appreciate as land gets scarcer and population continues to grow. Hence, most people see property investment as a good hedge against inflation. “But the caveat is that it must be a good property type in a reasonable location, as there are also many cases of failed property investments,” Khong cautions. Although the entry cost to own a property is quite substantial, the good thing about property investment in Malaysia is that prices will not fluctuate as much as the equity market or other high-return investment tools and it is low-risk for owner-occupiers. Malaysian Institute of Estate Agents (MIEA) president-elect Lim Boon Ping thinks that buying property is the best way to accumulate wealth as it could offer returns from both rental and capital appreciation. Lim says a property in the Klang Valley could fetch an average of around 3% rental return yearly and a minimum 5% capital appreciation annually, which comes up to an investment return of about 8%. Compared with other low-risk wealth accumulation tools, such as fixed deposits which provide around 3% to 4% returns, a property would be a better choice to preserve one’s wealth. Nevertheless, MIP Properties senior negotiator Freeman Woo points out that the current oversupply in the market of certain property types might put pressure on price growth in the secondary market. He, however, also believes that land scarcity and the growing population will provide the fundamental support for price growth in the long run. “Like other developing nations, Malaysia is now at the stage of ‘robust production’. Oversupply is normal at this stage, but as the population increases, the market will absorb the supply, thus pushing prices up,” Woo explains. Khong observes that residential property prices in the Klang Valley have been climbing for the past 20 years and have staged a strong rebound after every trough. “Property investment is considered a good hedge with an average compound annual growth rate (CAGR) of 7% to 10%. “Compared to the high-rise residential segment, landed properties have performed slightly better over the longer term,” he notes. Savills Malaysia has collated annual transaction data of several established residential areas in the Klang Valley, tracking their housing price trends from 2001 till 2017 and found that among some of the best-performing areas in terms of capital growth were Cheras, Bangsar, Puchong, KLCC and Mont’Kiara. Bangsar, an affluent neighbourhood a mere 5km away from KL city centre, is one of the most sought-after addresses as it offers complete amenities, great accessibility and a strong sense of community. This old neighbourhood comprises terraced houses, bungalows, apartments and high-end condominiums. According to Savills’ data, single-storey terraced houses in Bangsar which averaged RM375,000 in 2001, jumped to RM635,000 in 2010 and RM1.27 million in 2017, recording a capital appreciation of 239%. 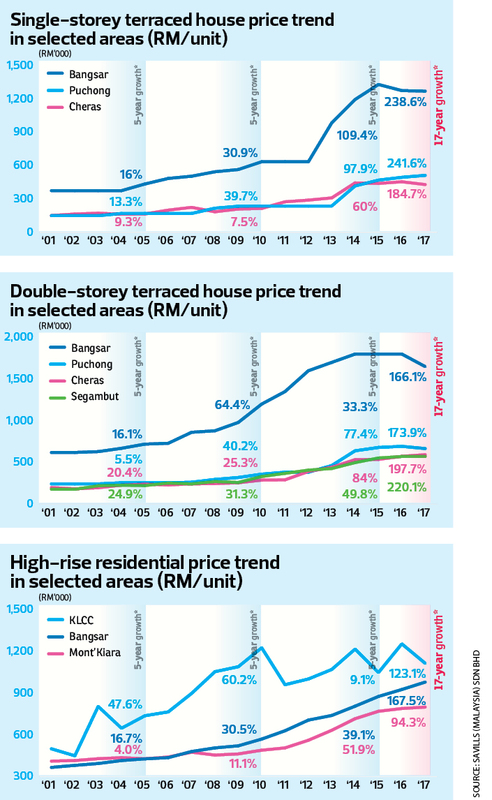 Double-storey terraced houses in Bangsar, which were sold at around RM620,000 in 2001, saw their average selling price climb past the RM1 million mark in 2010 and reached RM1.65 million in 2017, a price increase of 166%. MIP Properties’ Woo notes that Bangsar has a good mix of expats and local residents, which makes it a unique community with a good variety of offerings in terms of F&B, retail and entertainment. For example, while the Lucky Garden shops attract more locals, the Jalan Telawi area has a good mix of retail and F&B offerings that attract both locals and expats. “The good mix of different cultures and elements within the neighbourhood is what makes Bangsar attractive to homebuyers. In addition, land scarcity, growing population and the business activities there also support the price growth of the properties in Bangsar,” he opines. Savills’ Khong notes that although Bangsar’s property prices are far from what one would call affordable, homes here are still in high demand. “For instance, a single-storey terraced house located close to the main road has exceeded RM1.2 million and is still moving northwards whilst the old 2-storey terraced houses in Jalan Terasek are asking for around RM1.7 million,” Khong reveals. He reminds interested buyers to set aside another RM750,000 to RM1 million for refurbishment as most landed houses in Bangsar are old and may require renovations and improvement to suit modern needs. Landed property values are backed by land value, which is one of the most valuable and limited resources on earth, but high-rise properties also have investment value especially projects in prime locations such as KL city centre and Mont’Kiara. As shown in Savills’ data, condominiums in the KLCC area (such as Corinthian, Marc Service Residence, Park View Service Apartment and Stonor Park) have an average selling price of RM500,000 in 2001. Subsequently, their transaction prices exceeded RM1 million in 2008 and reached RM1.12 million in 2017, equivalent to a capital appreciation of 123%. For Mont’Kiara, the average transaction price in 2017 was around RM800,000 compared with RM411,667 in 2001, thus fetching a capital appreciation of over 94%. Lim from MIEA says KLCC, Mont’Kiara and Bangsar are mature and established areas. The housing prices in these locations are perceived as at high levels currently but he believes the uptrend will still continue as these locations are major commercial hubs. MIP Properties’ Woo points out that the KLCC and Mont’Kiara residential property markets have dipped since hitting their peak in 2013. Price growth of non-landed residential property on the secondary market has slowed, thus offering investment opportunities to cash-rich investors. However, for owners who are looking to realise their investments, the near term will not be a good time as the asking prices in the secondary market have declined. “Both Mont’Kiara and KLCC have strong advantages that could support future price growth and demand. For instance, Mont’Kiara is popular as a home choice for many expats due to its community, amenities and international school choices,” Woo says. “For KLCC, which is in the capital city of Malaysia, it will definitely be the first choice when foreigners consider visiting Malaysia or to settle down in this country. In addition, land scarcity is also another factor that will support price growth,” he elaborates. Khong from Savills says many of the older condos in these two locations fall short due to their bigger built-ups (over 2,000 sq ft and selling above RM1.5 million). Newer products have since reduced in size and many of them have performed well in the past few years. As one of the biggest and oldest residential areas in the Klang Valley, Cheras is a well-established neigbourhood with the majority being business owners and home owner-occupiers. Overall, landed homes in Cheras have enjoyed a stable price growth. The average selling price of a single-storey house in Cheras was around RM151,000 in 2001; the average price climbed to RM215,000 in 2010, then surged to RM430,000 in 2017 – that is a capital growth of close to 185%. For double-storey terraced houses, the average transaction price in 2017 was RM593,333, but back in 2001, these properties were sold at an average price of RM199,333, equivalent to a capital appreciation of 198%. Khong from Savills notes that Cheras’ proximity to Kuala Lumpur city centre makes the neighbourhood attractive to both homebuyers and business owners. “The newer redevelopment areas along Jalan Cochrane and Jalan Cheras are focused on strata residences while the older parts of Cheras (towards Cheras Leisure Mall) are established landed housing areas interspersed with some strata commercial and industrial offerings,” Khong says. There are a few significant new mixed commercial developments in the neighbourhood such as Ikea MyTown Shopping Centre, Sunway Velocity Mall and EkoCheras Mall. These plus the well-established Aeon Taman Maluri and Cheras Leisure Mall, will be the catalysts for the future growth of the area. He notes especially the EkoCheras integrated development next to the Taman Mutiara LRT Station as it is expected to refresh the eastern Cheras corridor. Puchong, popularly known as the centre of the Klang Valley, offers easy highway access to the various parts of Klang Valley including Kuala Lumpur city centre, Petaling Jaya and Subang Jaya. Puchong has been attracting new homebuyers and families as well as people relocating from other states into the Klang Valley for work. Taman Kinrara, Bandar Kinrara and Puchong Perdana are some of the most established residential areas in Puchong. These areas are highly populated with various amenities. According to Savills’ data, in 2001, the average transaction price for single-storey terraced houses was at RM150,000. The same type of houses were transacted at RM512,500 in 2017, equivalent to a capital appreciation of close to 242%. Double-storey houses in Puchong fetched an average transaction price of RM243,333 in 2001, and prices rose 174% to RM666,667 in 2017. Savills’ Khong says improved public transportation coupled with an existing well-connected road network have enabled development to move further to the inner parts of Puchong, such as Puchong Utama and areas close to Bukit Jalil, Seri Kembangan and Cyberjaya. The LRT Line Extension has seen eight stations linking Puchong to neighbouring areas such as Bukit Jalil, Sri Petaling, Putra Heights and KL city centre. “Puchong, Kinrara and Bukit Jalil areas are now considered semi-prime locations with various major developments in place, namely IOI City Mall, Pavilion Bukit Jalil and the KL Sports City,” he adds. The data has shown us large and exciting investment return figures but Lim from MIEA reminds interested players that property investment is a long-term game which will take about five to 10 years to see returns. “For individuals struggling to make ends meet, they should take prudent steps in choosing the right property that could possibly fetch good returns while not over-stretching themselves financially,” Lim advises. He opines that the potential growth of new and emerging areas with rising populations such as southern Klang Valley’s Semenyih and Dengkil shouldn’t be underestimated. Lim notes that the location element might be the main consideration in property investment but one should consider the future potential of an area and once future catalysts or growth prospects have been identified, buying decisions should be made at the early stage when prices are low. “Take Bandar Utama and Puchong as examples. These places were known as ‘no-where’ some 20 – 30 years ago. The majority of the market would not buy anything here at that time. However, as urbanisation took place, these two places are now among the most wanted locations for property buyers,” he highlights. MIP’s Woo opines that although asking prices and transactions in the secondary market have declined over the past three to four years, this has opened up an opportunity for purchasers to look for properties that suit their budgets, especially in prime areas such as KLCC and Mont’Kiara. As for investment timing, Khong from Savills expects the market to be relatively flat for the next half of this year (2018). This will be a good time for purchasers to look out for bargains during the slow market, he says. “We hope for a basket of goodies for the property sector in the next Malaysian National Budget in the fourth quarter this year, on whether there will be relaxed guidelines on end-financing as this could be a major catalyst to boost market demand,” says Khong. This story first appeared in the EdgeProp.my pullout on Sept 28, 2018. You can access back issues here.